The proper functioning of the lymphatic system is critical to our body’s ability to drain fluids, detoxify, regenerate tissues, filter out toxins and foreign substances, and maintain a healthy immune system. The aim of lymphatic drainage massage is to improve lymph drainage by moving the excess fluid in the lymph vessels away from swollen areas so that they can drain normally. Massage aimed at lymphatic drainage was developed by Emily Vodder in the early 1930s and is often regarded as being an alternative therapy treatment. Officially known as Manual Lymphatic Drainage (MLD) it is described as a gentle type of skin massage and is important for good health. Unlike the blood vessels (arteries and veins) the fluids in the lymphatic system are not pumped through the body by the action of the heart. Instead it is the action of the muscles that moves the fluid in the lymphatic system. As you move, the muscles tighten which causes them to squeeze the lymph vessels and push the fluid along. This results in fluid being drained back into the blood supply, or released through urine if it is unable to be used again. Lymph drainage technique uses gentle, rhythmic, and relaxing pressures which clients find soothing. It is very important to begin and end any treatment with the numerous nodes and vessels of the neck. 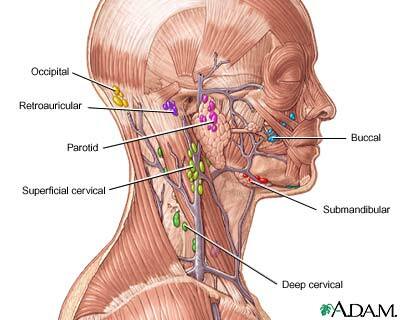 This is the last area that the lymph fluid will go through before going to the large blood vessels of the neck and the heart. MLD can be performed for up to an hour a day, up to three times a week. MLD is effective for most people, but it can take time to‘re-educate’ the lymphatic system and maintain the improvement. It is not always possible to predict exactly how many treatments are required. Who benefit from having massage lymphatic drainage? Lymphedema that involves the areas such as the trunk, neck, leg, genital, neck will benefit from MLD. Pre and post-surgery to reduce swelling improve the healing of the scar; help prevent infection by releasing toxins. Fibromyalgia, MLD can have a pain reducing effect. Reduction in the appearance of scars and wrinkles. Improving the skin’s tones and texture. If you have hardness of the tissue (fibrosis) it may lead to discomfort/tightness of the tissue and which can restrict movement. When is MLD not recommended? If you have an acute infections or a recent history of thrombosis, tuberculosis or untreated heart problems. Breathing techniques and physical exercise are important as they encourage lymphatic drainage. Why not try the following simple breathing exercise? Have a short rest before getting up to avoid feeling dizzy.